Spicy, fermented goodness with simple, old-country heritage, this dish dates back to the Austro-Hungarian Empire. Its actual name is Szégediner Gulasch, but growing up no one could pronounce the name properly, so it came to be known as “Sock-it-to-me Goulash.” This recipe was passed down to me from Grandma and it remains a family favourite. The stick-to-your-ribs stew is served over homemade German-style bread dumplings, also known as Semmelknoedel. A great dish to make ahead, it just gets better every time you heat it up! Pork shoulder is best for this dish as it will be the most tender, however I can’t always get it at the grocery store. Pork loin roast is a good substitute, even though it is lean the sauerkraut is tenderizing and it still tastes great. Let me share a tip it took me so many years to learn the hard way: DO NOT overcrowd the pot when you brown meat! If you do, you will find the meat steaming in its own liquid instead of turning crisp and golden brown. There are a few factors at play that cause this: first, all meat has some water content. If the pot is too crowded, all of the water releases and doesn’t come into contact with the hot surface of your pot, so it will remain and build until your meat is swimming in liquid for more of a steam/braise than a browning. The second issue I believe at play is that the temperature of the pot is more difficult to maintain at the high heat needed for a good sear when overcrowded, further compromising your ability to achieve a proper sear on just the outer edges of the meat. If you allow generous spaces between the pieces as shown below, you will achieve a lovely golden brown on the meat, and also build up a nice crust on the bottom of the pan that will deglaze when you add the onions, forming the base of a flavourful sauce. It’s totally worth the effort of splitting into batches to achieve the correct level of browning. A word on using lard. No one seems to speak of using it and I rarely see any recipes calling for this type of fat. Most people avoid cooking with it like the plague, thinking it to be extremely unhealthy. However, according to this article by the Huffington Post, it has “less saturated fat than butter, it’s higher in monounsaturated fats which are said to lower LDL cholesterol; and it has none of the trans fat that shortening does”. But really, the real reason I use lard is because Grandma told me under no circumstances to ever even think of substituting it with anything else. 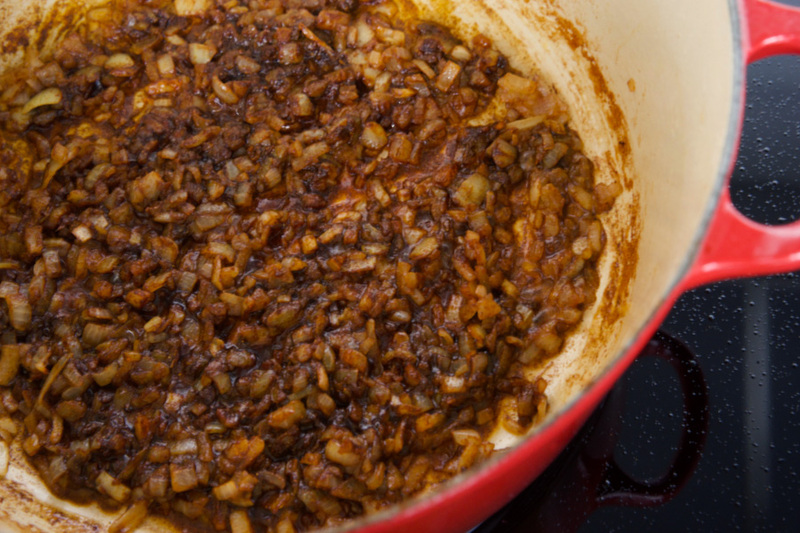 She knew instinctively that it can handle high heat without smoking, and using true rendered fat allows the onions to caramelize in a way they could not with olive oil. It gives just the right silky body to the final dish without imparting any unwanted flavours. 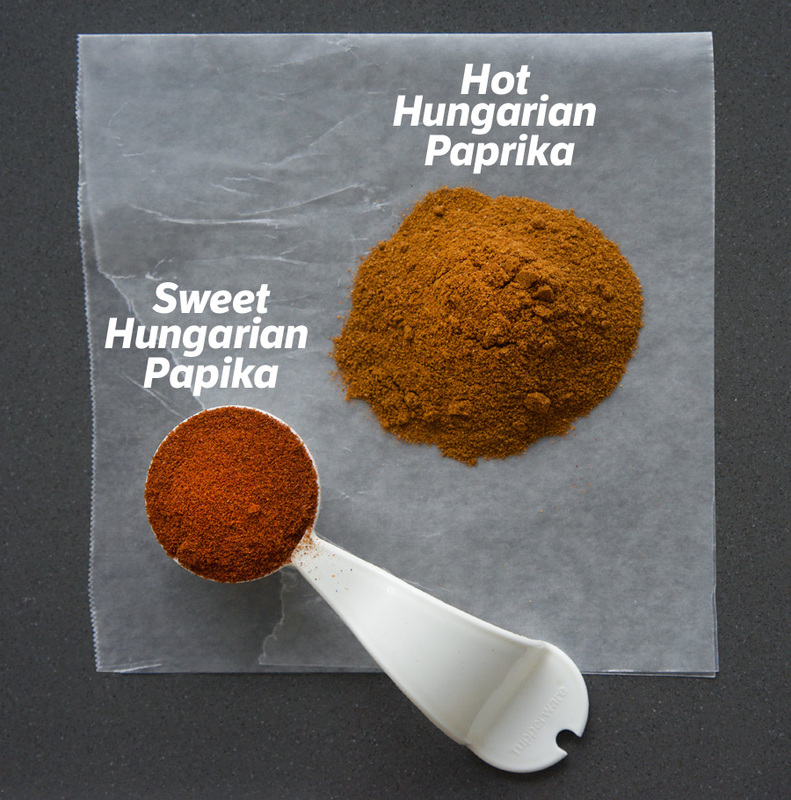 Paprika is an essential ingredient in Hungarian kitchens. Not to be confused with Spanish Paprika which has a totally different flavour, you must use true Szeged Hungarian-style Paprika for this recipe. If I were to describe the difference, I would say Hungarian Paprika is smokey, deep and almost more chili-like, while Spanish Paprika I have had is more sweet with essence of fresh peppers. Once I tried mixing a bit of Spanish Paprika into the Goulash, thinking it would add an additional flavour dimension, but it was completely out of place and didn’t work at all. For this recipe, I like to make it a bit spicy and love to mix half sweet with half hot Hungarian Paprika. 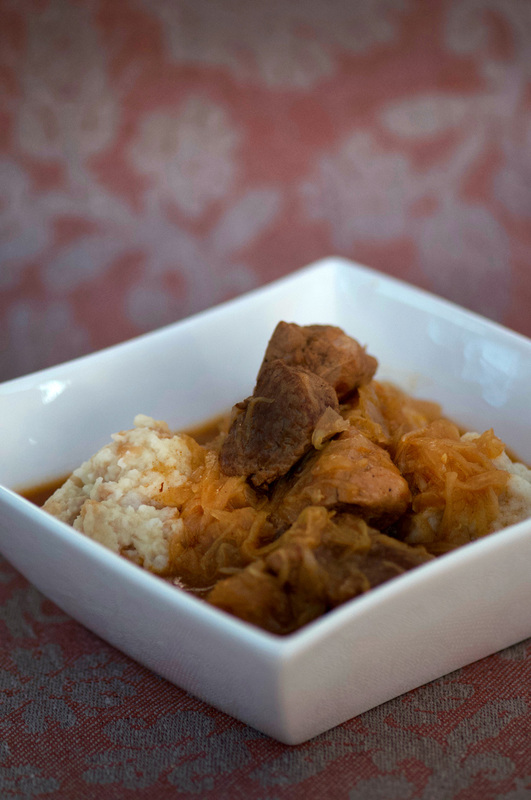 It gives the dish a some edge that compliments the sauerkraut for the best possible mash-up. However, you can adjust the mix to as much or as little heat as you like. Just don’t substitute with Spanish-style Paprika, please! When cooking with Hungarian Paprika, it is always recommended to cook it at medium-high heat in some fat to maximize the flavour, so I recommend adding it to the onions just before returning the meat to the pot, stirring for a minute or so to bring out the spice. 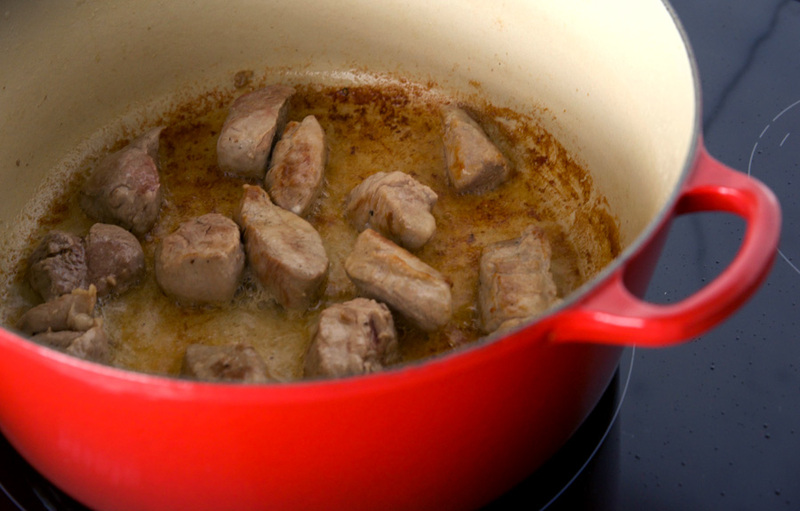 Then you can add the meat back in and top it off with water for a long, gentle simmer to tenderize the pork. Finally, the sauerkraut is added near the end and cooked a bit longer to further tenderize the meat. When you use good quality imported sauerkraut there is no need to drain the liquid, I put the whole can, juices and all, into the pot. 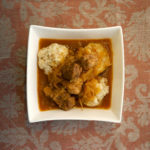 While the goulash is cooking, you can make the bread dumplings. These dumplings have always fascinated me—how do regular kaiser buns turn into these awesome morsels, with a firm texture that perfectly compliments the goulash? Keep reading to find out! To begin, tear up the kaisers and spread onto a baking sheet. Toast in a preheated oven for under 10 minutes until they are just a bit dry and lightly toasted. Transfer them into a large bowl where you’ll mix in egg and milk and allow it to absorb (think: french toast-ish). But don’t wait too long, you need to add the flour (along with any seasonings) before the liquid fully absorbs and then mash up the whole thing until you get a sticky, dough-like consistency (see lower right pic). Then you just shape them into balls, before dropping them into simmering water to boil until they are cooked through, firm but fluffy. After having these, I just can’t go back to potatoes with this goulash, only bread dumplings will do! Kimchi might be the cool, trendy cabbage the kids are into these days, but trust me, Grandma always knew best. This goulash is savoury, spicy, fermented goodness with simple, old-country heritage that truly satisfies. 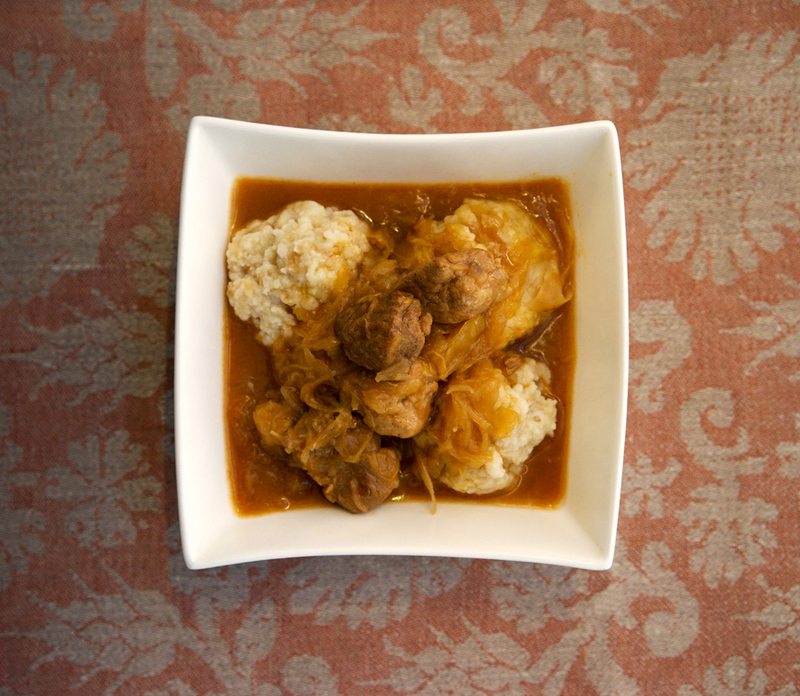 Grandma's hearty and spicy recipe for pork goulash with sauerkraut, served with bread dumplings. In a large dutch oven or heavy pot, melt lard on high heat. Add 1/3 - 1/2 of the meat, ensuring the pot is not overcrowded and there are spaces between the meat pieces to ensure effective browning. Brown meat evenly on all sides until deep golden brown in places, about 5 minutes. Transfer meat to a bowl to rest and continue with the rest of the pork until all of the meat has been well-browned and transferred into the bowl. Add onions to the pot, reduce heat to medium-high and cook until light golden, stirring to avoid burning. Scrape up the bottom of the pot to release any browned bits of meat as you stir the onions. Add Paprika and Cayenne and stir into the onions; cook about 1 minute to bring out the flavours in the spices. Add water to cover meat. Bring to a boil and add salt. 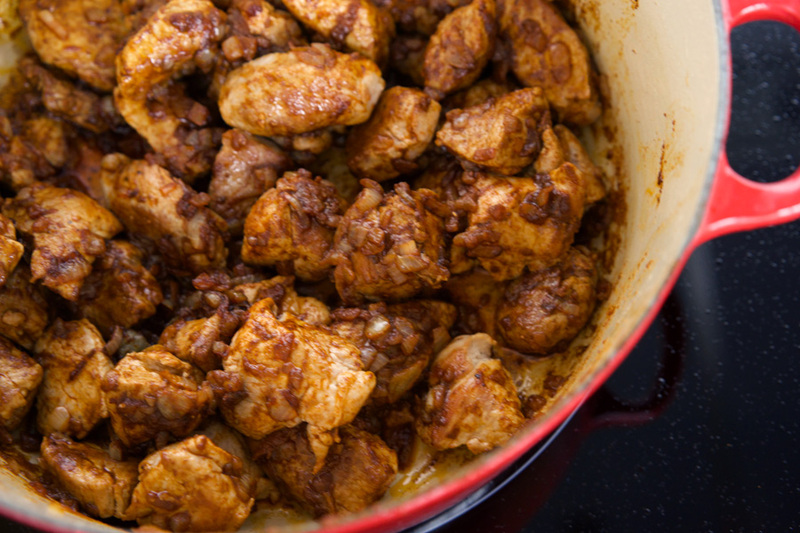 Reduce heat to medium-low and simmer until the meat is tender, about 45 minutes. Add sauerkraut and cook an additional 30 minutes. In a small bowl combine about 1/2 cup water with cornstarch and flour and stir well to dissolve. Add to pot and stir until thickened, about 5 minutes. Serve with bread dumplings. Preheat oven to 325°. 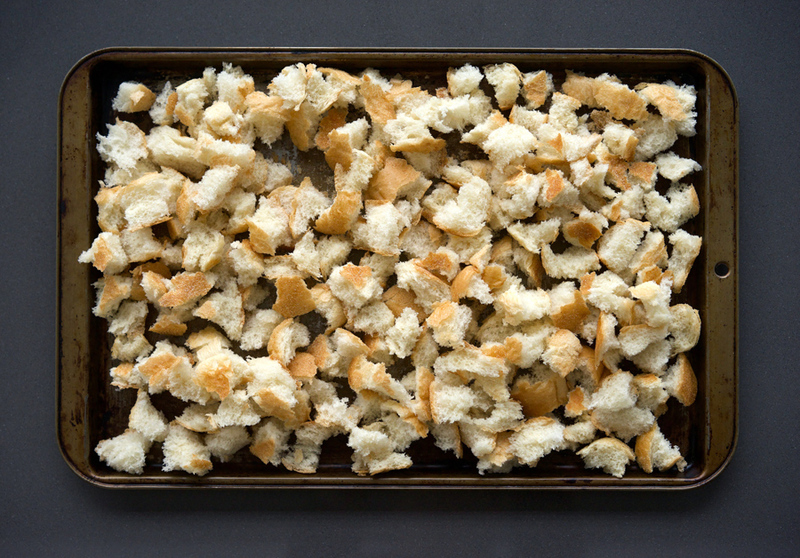 Spread torn Kaiser roll pieces out on a baking sheet. Add to preheated oven and toast for 7 minutes, until bread is just lightly toasted. Remove from oven and place in a large bowl with salt. In a separate bowl, beat eggs with milk and add to bread mixture, stirring to allow the bread to soak up the liquid. Sprinkle with the flour and use a fork to shred the mixture into a dough-like consistency. The mixture will be sticky, so keep some extra flour aside that you can dip your hands into, to reduce the dough sticking to your hands. 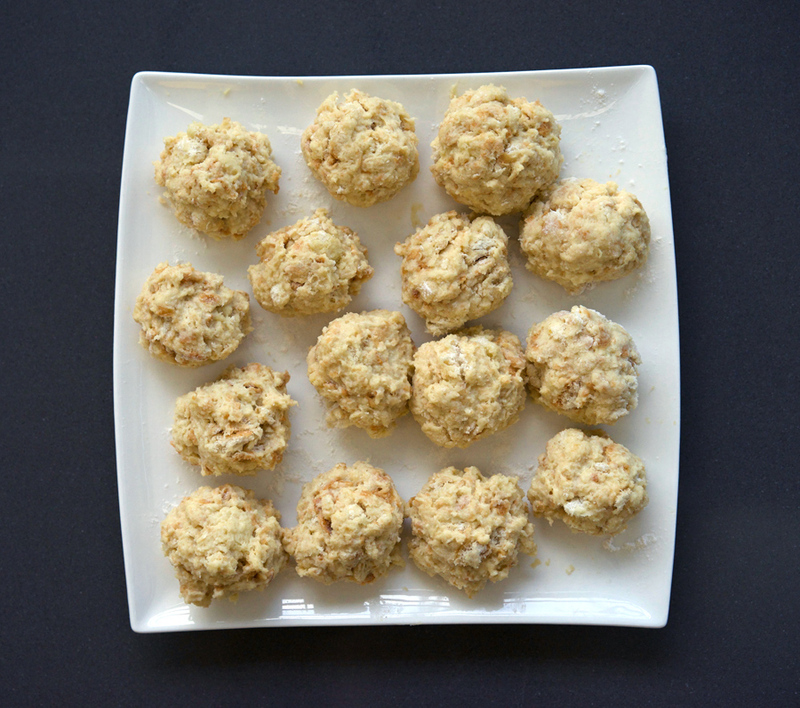 Form dough into 1.5" balls and place on a plate. Bring a large pot of water to a gentle simmer. When all of the balls are ready add them to the water to a maximum of a single layer at the bottom of the pot. Simmer for about 20 minutes—the balls will rise up to the top when they are cooked through. Remove from the water with a slotted spoon and reserve until ready to serve with the goulash.